In this guide, we will show you how to set up your HD IP Bird Box Camera on your Windows computer. Download the latest version of the windows PC software using the link below. 1. Click on the CMS5 icon to launch the programme, a dialog will appear. Key in the username and password to enter Main console. 2. 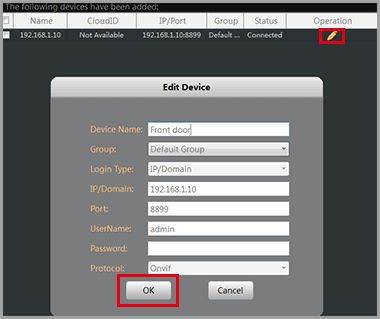 In the "Main" view, Click “Device Manage”. 3. Click the “IPV4 search” button. The available devices will display on the section at the top. 5. click “Add ” button. The IP camera will move into the box below. 6. Click the pen icon under “operation”, a new dialog pop up, name the camera, Click “OK” to save. You have not configured the camera, next we'll show you how to watch it. 1. Click on the "home" icon. 2. Click "monitor" to view the camera. 3. Double click on the name of the camera to start the live view.